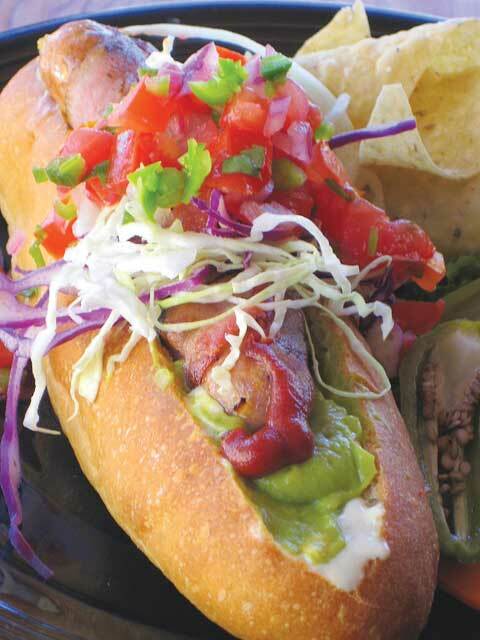 Also known as a TJ Dog or Sonoran-style hot dog, the Mexi-Dog is a street food staple in Mexico and the Southwest US. This recipe documents our effort to realize this dish in its platonic ideal: hand-made frank from grass-fed beef, wrapped in hand-made bacon from Berkshire pigs, snug in a house-made semolina bun and topped with hand-made mayonnaise from pastured chicken eggs, and heirloom tomato pico de gallo. It’s what the Mexi-Dog would have been if it had existed in the late 1800s. *Grass-fed beef sourced from Spanish Oak Ranches in the Edna Valley near San Luis Obispo, CA. Rinse and soak sheep casings in tepid water. Grind beef and tallow through large grinder plate. Mix meat and fat with salt and Prague Powder. Spread onto baking sheet and put in freezer for 30 min. Remove meat from freezer and grind again through a small grinder plate. Add simple syrup, sugar, garlic, mustard, paprika, coriander, and pepper. Emulsify mixture in a KitchenAid mixer, small batches at a time. Be certain the mixture temperature doesn’t rise above 55°F. If it does, put mixture back in freezer for another 30 min. Stuff emulsification into pre-soaked sheep casings and twist into links. Refrigerate links, uncovered, overnight. Cold-smoke links (<90°F) for 2 hours. Poach links in 160°F water until they reach an internal temperature of 140°F. Transfer to an ice bath to chill. Mix salts, spices, and sugar well. Rub the dry cure into the lean side of the belly. Turn belly over and rub mixture into fatty side. Put belly into a non-reactive plastic container, cover with plastic, and place a weight on top of meat. Cover and refrigerate for 10 days, flipping belly over and overhauling mixture every couple of days. Pull belly from container, rinse, and refrigerate uncovered overnight. Load belly into smoker and smoke between 100°F and 120°F for up to 10 hours, until desired amount of smoke finish is attained. Refrigerate, unwrapped, for use. *Berkshire pork sourced from NZ Ranch in the Edna Valley near San Luis Obispo, CA. Salt to taste. Toss ingredients together and allow to macerate for 30 min.-1 hr. NOTE: You need eggs from pastured chickens to make the best mayonnaise (The chickens called “cage-free” or “free-range” ain’t the same thing). If you don’t know a farmer with outdoor chickens, you can buy your own chickens and raise them in your backyard. Check out http://www.urbanchickens.net/search/label/resources for tips and suppliers. Salt to taste. Roast the tomatillos in their husks at 35O°F until soft and oozing. Peel when cool and set aside. Meanwhile “dry” sweat (without oil) the onion, garlic, and jalapeno until they begin to soften. Add the reserved tomatillos and remaining ingredients and simmer 30-40 minutes over low heat. Allow to cool a bit, puree in a blender or food processor, and run through a course strainer. Return mixture to pan and reduce until it’s reached the syrupy consistency of catsup. Adjust seasoning and cool before serving. In bowl, use a fork or a potato masher to crush the avocado to desired smoothness or chunkiness. In the bowl of a stand mixer, add all dry ingredients. Mix wet ingredients separately, then add to dry and mix on low speed with a dough hook to incorporate, then increase speed to high and mix 10-15 minutes until the dough begins to “slap” against the sides of the bowl. The dough should be quite wet. Resist the temptation to add flour. Allow the dough to rise until doubled, about an hour, then punch down and with floured hands, portion into 4 oz. chunks, then roll into logs, 5-6 in. in length. Place on parchment lined sheet pans, rub with oil or spray, and loosely cover. Proof until almost double, another 45 minutes or so. Meanwhile, preheat oven to 425°F. Uncover and bake 10-12 minutes until golden brown. Wrap the dogs with the bacon and griddle or grill them over medium heat until the bacon is bubbling and crisp. Slather bun with handmade mayo and crushed avocado. Place dogs on top. Top with pico de gallo, shredded cabbage or lettuce (optional) and tomatillo catsup.